Vinyl enthusiasts embracing analog well beyond the entry level is becoming more and more common, with many of our readers possessing or contemplating multiple turntables, or at least a turntable with two (or more) tonearms. The more diverse your record collection and shopping habits, the more having more than one cartridge at the ready makes perfect sense. The further you go down the rabbit hole, the tougher it is to find one cartridge, no matter how expensive, to do justice to a diverse record collection. Often, having a pair of moderately priced, but different sounding cartridges will serve a broad record collection better than a single, mega cartridge. As you add mono records, vintage records and especially the more time you spend in the budget bins, a second cartridge is handy. Enter the AVP-01 from Audolici, handcrafted in Portugal. 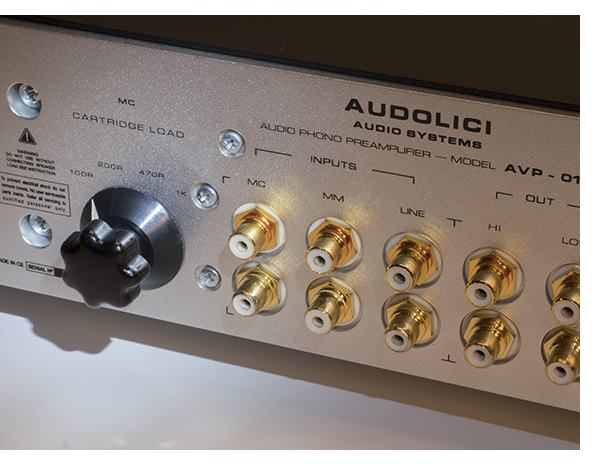 Priced at only $4,930, it combines an excellent line level preamplifier and two separate phono inputs – one MM and one MC. The MC has adjustable loading, with settings at 100, 200, 470 and 1000 ohms, which should be enough for nearly everyone. On the other end of the spectrum, with DAC’s becoming increasingly broad in their functionality, in many cases they have become the digital hub of a system, only requiring the linestage to have one more analog input to accommodate it. For this user, the AVP-01 is perfect. Its single (RCA) analog, line level input allows you to connect your favorite DAC along with two turntables. There’s even a headphone jack on the back panel, bonus! At the heart of the AVP-01 is a handpicked, Russian military 6H2P tube. US importer Harold Cooper of Sound Consultant Ltd. tells me this tube is equal to a 6SL7, but suggests sticking with the stock Russian tubes supplied as “this is what they voice the preamplifier for.” There are two line-level outputs on the rear panel, one marked “high” and the other “low, referring to the output impedance, (not output level) with high offering 47k and low only 2,000 ohms, bypassing the output buffer. The AVP-01 takes a novel approach to utilizing the tube inside. 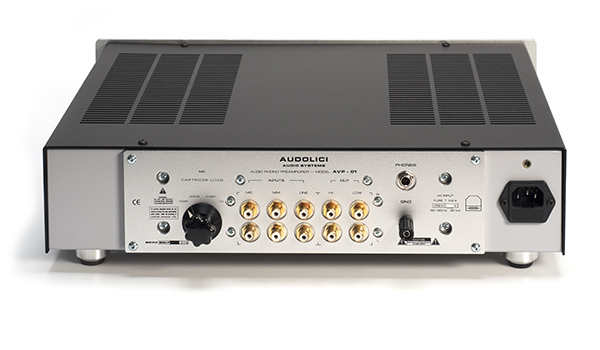 Where many hybrid designs put the tube squarely in the gain or buffer stage, Audolici uses the 6H2P as part of the MM gain section, with MC relying on a single, low noise transistor. The output buffer stage is solid state as well, so your high level source will have a slightly different sonic character than the turntable of your choice. 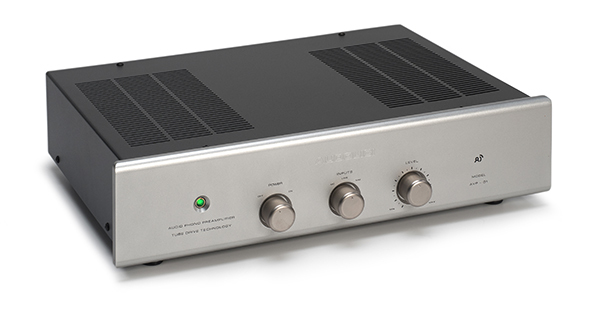 In concert with the Nagra 300p power amplifier, the reference in my office system only about two feet away, via a short Cardas Iridium interconnect, the low impedance output offers more transparency and immediacy, so experiment with your amplifier and setup. If the high frequencies appear rolled off, you’ve got it wrong. Unable to resist temptation, the tube was installed and I went straight to vinyl. 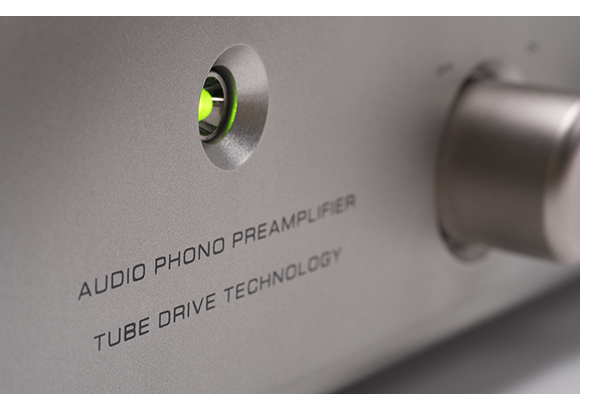 The AVP-01, like any tube component takes about 30-40 minutes to fully warm up and give its best performance. Where some preamplifiers take hundreds of hours to fully burn in, the AVP-01 sounds great out of the box and only improved slightly after a few hundred hours, so this is one you’ll love right away. The new Technics SL-1200G, with removable headshells made it extremely easy to switch between the Gold Note Vasari MM ($385) reviewed in issue 82, an Ortofon 2M Black ($900), Ortofon Cadenza Bronze ($2,700) and the Transfiguration Proteus ($6,000) cartridges with ease. Taking advantage of both inputs called for the AVID Ingenium turntable with a pair of SME 3009 tonearms. Moving between different cartridge combinations proved oodles of nerdy analog fun. Settling on a Denon DL-103r and the Ortofon 2M Black made for exciting comparisons, with the Denon slightly on the warm side (and requiring the 100 ohm loading) where the Ortofon is more natural, with no embellishment, yet offering more extension. This pair of cartridges on the Ingenium made for a great analog setup that didn’t cost a fortune and made for a lot of enjoyment, especially tracking through current as well as vintage LPs. Neither the 70s nor todays vinyl has cornered the market on sonic consistency; once you get used to having a pair (or more) of cartridges at your disposal, I suspect you won’t go back. The AVP-01 makes the process effortless. Dropping the stylus on a 45 r.p.m maxi single of Prince’s “I Hate U,” reveals a delicacy that is definitely not present on the CD. Gone is the typical harshness surrounding Prince digital recordings, with the highs silky smooth, and a soundstage opening up well beyond the speaker boundaries in my nearfield system. Comparing the AVP-01 to a few other things on hand, from vintage to contemporary, leaves the impression that it’s overall tonal balance is just so slightly tipped towards the warmer, more saturated side of the spectrum, and you’ll never get an argument from this reviewer over that. But choose your sonic preferences accordingly and remember you can always alter the overall balance by the cartridge(s) you choose. You won’t mistake the AVP-01 for an all solid-state preamplifier, but it doesn’t sound like a vintage tube preamplifier from the 70s either. Transients are quick and zippy, the bass has weight without sounding slow, sloppy, or one-note and of course, the midrange is lush and full of body. Considering what a separate two input phono stage along with a linestage would set you back (and an additional power cord, pair of interconnects, etc. etc.) the AVP-01 is a pretty incredible value. Running the AVP-01 through a gamut of power amplifiers after initial listening with the Nagra also proved easy. It had no problem driving anything from our vintage Conrad – Johnson MV60SE, SAE 2200 or the Nakamichi 610. Modern day amplifiers proved equally fruitful, with the new VT80 from Audio Research being particularly lovely. While I suspect you will probably invest in the AVP-01 for its analog capability, it’s worth mentioning that it is no slouch as a straight-ahead linestage either. Bringing the dCS Rossini DAC/Clock combination into play made for equally pleasing digital listening sessions. The AVP-01’s output buffer must be labeled a success because it did not seem terribly cable dependent. Some tube preamplifiers can be fussy when choosing output cable, but the AVP-01 sailed through. The same can be said for power cords; a bit of improvement was there to be had with a Cardas Clear power cord, but the AVP-01 isn’t lacking plugging it into the wall with the stock item. Headphone listeners should be excited by the AVP-01’s headphone amplifier, and considering the ease by which it drove the Sennheiser, AKG, Audeze and Oppo phones in my collection, I doubt that you would want to invest in an additional outboard headphone amplifier. It had no trouble driving any of my phones and the sound was indeed robust. Even the AKG-701s, which are usually tougher to drive, exhibited great bass control and a big, broad soundstage. The planar phones also did very well, and all could be driven well beyond reasonable volume, so watch yourself there! 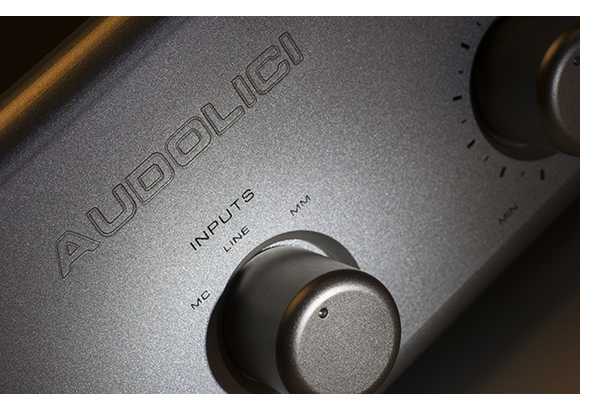 If you have two turntables at your disposal, the Audolici AVP-01 preamplifier is going to provide you with ease and enjoyment. If you don’t have a second record player, I suspect you will before you know it. In addition to excellent sonic performance, the understated elegance and modest profile of the AVP-01 will fit into any situation with ease. Our review sample arrived in the silver you see here, but it is also available in black or red. Tempting. Bottom line, I’ve purchased the review sample to use as a reference component in my office system. The two analog inputs are just what the doctor ordered for evaluating cartridges while editing copy. The performance and flexibility offered for the price asked is way above what you’d expect. So, we are awarding it one of our Exceptional Value Awards for 2017. And, you can expect a long term follow up in about a year. We’ll let you know how the AVP-01 stands up to 12 hour a day duty. Highly recommended. Please note that all TONE Audio copy and photography is © 2005–2017 TONE Magazine LLC. The RSS feed provided is for personal, non-commercial use only.